Are all 3/4 exhaust loud? Just mounted my AR GP1R and its too loud for my taste. Are the other brands this loud? 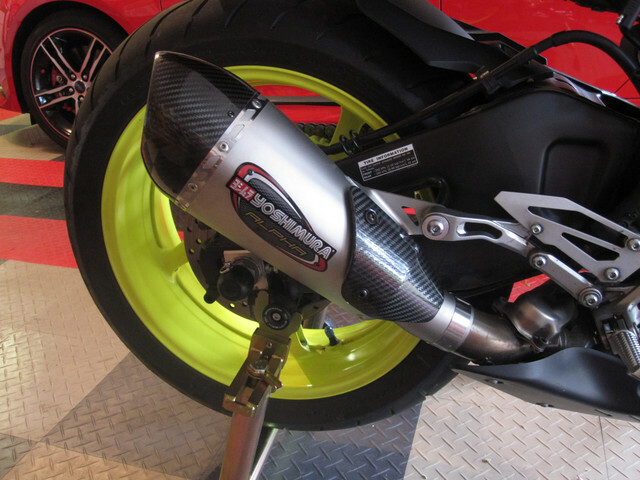 Yoshi, Akrapovic? I'm going back to stock form. The hindle was too loud for me too. Much better after putting the DB killer in. I have the Graves 3/4 w/o EVR and it is a little loud but not obnoxious. It is also a long silencer. I have this one too, with the sound insert installed it's a little louder than stock and sounds good. With the sound insert removed...it's pretty damn loud and can get annoying without ear plugs. Loudness is a very subjective thing. Some people think a loud bike sounds fine when other people wouldn't tolerate it so I take loudness acceptability comments with a grain of salt. Most of the silencing is done in the cat, if you remove it you are essentially stripping off much ability for a 3/4 system to really control the loudness since most of these systems are a straight pass through design, just like the OEM muffler. My take is if you remove the cat, you need a system with either a standard or optional 'dB killer' insert. I bought the Graves slip-on, and it's absolutely perfect for what I wanted: OEM looks (especially without the decal), OEM fit and finish (actually better IMO), and MUCH better looking. Very deep but not obnoxious. I wouldn't want it any louder, so mission accomplished. Hey Evitzee, what do you have? 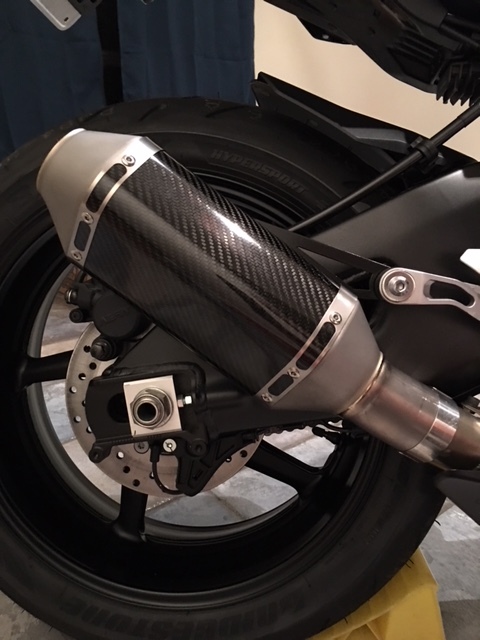 I've got a Yoshimura Alpha T slip on....a bit louder than stock but the tone is deeper and you get the full effect of the cross plane crankshaft. No dB killer needed although one is supplied with the kit. Have always had good luck with Yosh products, extremely well made in the USA and never any problem with fitment. I have the yoshi Alfa t 3/4 system and its stupid loud. Sounds awesomely awesome though! I trying out the quite core in it now and it does tame it down some. Oh well... guess i'll be down for another week again while i get my ecu flashed for the stock exhaust. The Yoshi was my second and only other option, since it also has a proper bracket and clamp, but there was no way to remove the decal (which is riveted), and a little bulkier than I liked. Was about to buy it when I learned about the Graves on a bike for sale ad here, and immediately knew that's what I wanted. That I could buy it a bit cheaper than the Yoshi was icing on the cake, and it's Ti and C/F. It'll be nice to compare sound when we get together in the Hill Country, but I suspect they'll sound very, very similar. Like you said, you can hear every pulse of the CP4, with a very muscular, deep tone; just awesome. Do you get a better sound with the stock mid pipe (with the cat) and just changing the OEM silencer? The OEM one looks like it is basically straight through with very little baffling. I would have thought just changing the silencer and keeping the stock mid pipe would make very little difference. I initially did my ecu flash with the stock exhaust it’s not going to be any quieter than that AR you have both are basically straight pipes with no baffling! I will be putting my cat back on also. Ahh okay wasn’t sure but in that case it’ll be nice and quiet. I honestly don’t think the price of an aftermarket exhaust to be worth the money I get almost the same performance with the oem exhaust and the cat delete with flash! I don’t go to the track so really no need to spend a lot of money trying to squeeze every little amount of power that I will probably never need or use on the street! I can honestly agree with your decision to be honest. A slip-on can is just for looks. For some reason, I just couldn't stand the stock can; looks cheap and ugly to me. Since both are straight-thru, I wasn't expecting any better sound, but my Graves is noticeably louder and deeper than stock, and sounds exactly like I wanted, so felt a lot better about spending that money. He he. Yes, a tune would yield more power, but no way I'd risk my warranty, especially with 2 blown engines already. And I don't need any more, to be honest. Good luck. So you have the OEM mid pipe and Graves slip on (without EVR)? Correct. Just the slip-on. No other mechanical modifications whatsoever. And will stay that way, especially with 2 engine failures already . Looks nice. Almost OEM in a different style. I wanted some extra noise but not upset the neighbours or attract unwanted attention. Looks like Graves slip on is worth a go. 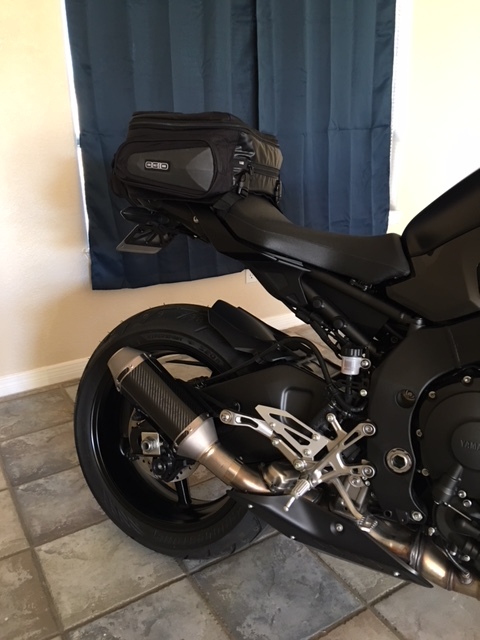 Not to thread-jack or anything but that Ogio tail bag looks really good on the back of this bike. Which tail bag is it if you don't mind me asking?